Which hat will you wear today? Sadly for the textiles specialist this isn’t a blog on millinery but it is instead about something which increasingly vexed me as a teacher and is equally vexing me in industry; the idea of wearing more than one hat. Why is it, as specialists that we are asked to do this and in design and technology it seems even more prevalent? Perhaps it is simply presumed that as technical and creative people we will automatically possess the skills necessary to fix your printer, replace a broken handle or glue the soles back onto a worn out pair of school shoes. 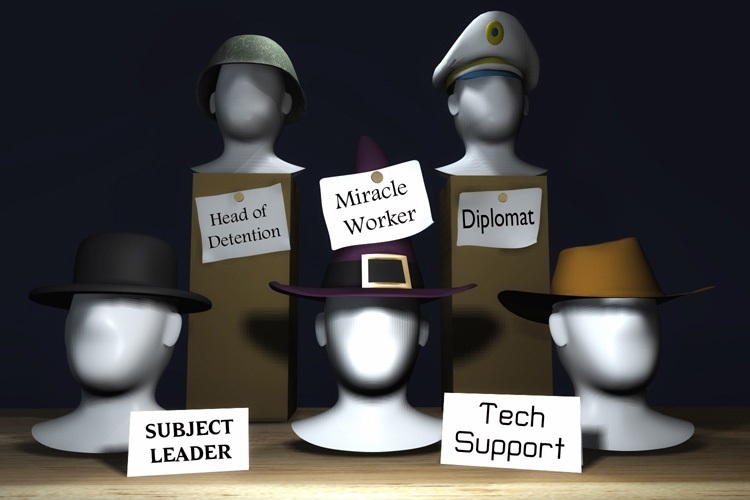 Of course, how many ‘hats’ you are willing to wear depends very much on your skill set, attitude and ability while how many you are expected to wear may also have to factor in the size of the budget available. Let’s see how many of these you can relate to (and I’m sure you have many more), In my time, as well as covering the usual range of CDT subjects (yes, I’m that old) and a range of D&T specialisms I have also covered ICT, art, music, media studies and a few other as well. However, I have been a head of a department consisting of one person; me, with responsibility for producing schemes of work, lesson plans and all assessment material. I have been the technician and teacher often found hunched over a broken band saw during practical lessons. I have been a caretaker in the same job. It wasn’t actually my job but given that I was the first port of call to mend banister rails, doors etc. it might have well been. Network manager, ICT hardware and software specialist, CAD and CAM maintenance, graphic designer, mechanic, welder, joiner, exam officer, painter and decorator, kitchen fitter (I kid you not) and I haven’t even left the classroom yet. Once outside its dinner supervisor, road crossing supervisor, bus driver, personal shopper, weekend supervisor, boarding staff, events and residential organiser, overseas trip assistant, navigator, translator, fund manager, musical director, set builder, interior designer...I will stop there just for brevity. Now I realise we have to be adaptable especially in the classroom but over the years I have watched as numerous people pass through the D&T workshop in search of tools, basic equipment they should already have (rulers, tape etc.) and favours (jobs) that need doing. I watched to see if any other department, and that includes the site mangers and caretaker, were approached to do such ‘jobs’ and I can honestly conclude that D&T is the first port of call for ‘staff in need’ and that often includes jobs better suited to ICT, PE or art!! So, not only is D&T a vital subject to a broad based curriculum and one that is necessary for the future of design and industry in this country, it’s also the most important department in school for holding together the very fabric of the teaching community. They do say that familiarity breeds contempt so that can be the only rational explanation for why the subject continues to be treated like a generic toolbox stored under the stairs. In case you were thinking that it’s just teachers getting a raw deal, it’s really not that different in industry so don’t feel too bad. In just 3 months as a CAD designer I was promoted to furniture designer within a week, but still somehow a CAD Tech?? any given day I am a CNC automation manager, CNC operative, bench joiner, concept artist, interior designer, draughtsman and, more recently, exhibition designer. I also make a mean cappuccino at a push. If it makes you feel better, it’s a testament to the versatility and range of skills of the staff in a D&T department that makes them so invaluable and prolific. Let’s hope the government (and schools) realise that before it’s too late. In the meantime, get in that wardrobe and dig out your various ‘hats’. Sadly there’s no wedding to attend (possibly a funeral or two) but who know what opportunities you will get this term to try on a few different styles; you may even get the chance to buy a new one. Paul taught Design and Technology for 23 years in a range of schools with stints as HOD and Head of a Creative Arts Faculty as well as teaching Art, ICT, Photography and Media Studies. He is currently taking a break from education to return to the design industry. His Subject Genius blog was shortlisted for the 2016 TES Awards.